Most pest companies do a good job of spraying, but they never really solve your problem. They spray your baseboards and cabinets with wet smelly chemicals and wait for the bugs come out of the walls to die. If that doesn't work, then they spray again. The resulting control may be enough for you not to see any bugs, but the nest and eggs are still there, resting and waiting for weeks, sometimes months until they emerge again. Research has proven that bugs live inside your walls and in dark hidden areas. Unless those areas are treated, your bug problem will never totally be solved. Unlike baseboard sprays that can leave behind a sticky or powdery residual, even stains on certain paints, carpeting and wall surfaces, our Wall and Void Treatment concentrates on the areas where bugs hide. Why spray walls when bugs are living and breeding inside them? Research has proven the cockroaches, ants and other social pests build nests inside your walls and in other dark hidden areas. Bugs don't build nests on baseboards. Why not hit'em where they live and nest? Get the best pest control protection possible! 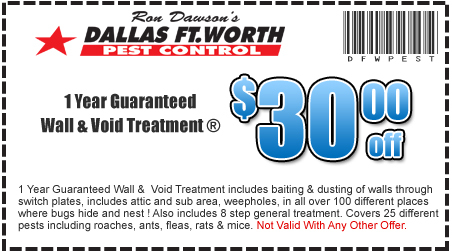 Get the Wall and Void Pest Control Treatment from Dallas Fort Worth Pest Control ! Our technicians treat by removing wall switch plates, plumbing accesses, and finding other entry points that lead directly into your walls. We then treat those areas with specially formulated dusts and baits that bugs feed on or are exposed to and die. There is no need to drill any holes, and no need to spray messy smelly chemicals. Our Wall and Void Treatment TM is state of the art, and was developed exclusively by us. It's the absolute most effective treatment available, and it only needs to be done once a year. If bugs come back at any time during the year, we will too - totally free of charge. 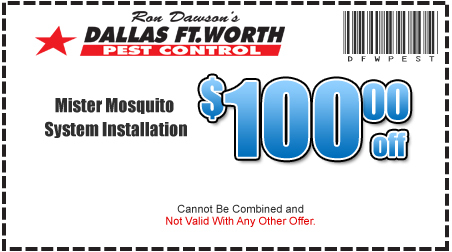 Year Round Pest Control Protection - GUARANTEED! Every 90 days we will return to treat the exterior of the home to keep bugs out. Our Wall and Void Treatment is simply the best pest control treatment available - period. If you don't agree, we will refund your money. It's that simple. No messy smelly chemicals or baseboard sprays. No need to empty cabinets or closets in most cases. Child safe, natural and synthetic materials for peace of mind. Kills bugs where they hide eliminating breeding spots. Exterior Perimeter - every 90 days to keep bugs out. Treatment is GUARANTEED FOR ONE FULL YEAR. Perfect for people concerned about pesticide use or health risks. Area environmental groups recommend our method of treatment. Fast, convenient appointments and scheduling. Contact Us For A No Cost or Obligation Estimate On Our Wall and Void Pest Control Treatment.